For decades, environmentalists have fought oil and gas development along Montana’s Rocky Mountain Front, where the Rockies nosedive into the plains. There, grizzly bears and elk abound, and streams are ripe with cutthroat and rainbow trout. The Forest Service and the Bureau of Land Management have allowed about a dozen wells to be punched in the area since the 1980s, but the Front is still nearly pristine. Seven years ago, former forest supervisor Gloria Flora banned oil and gas exploration in Lewis and Clark National Forest for 15 years; the oil industry sued, but the Supreme Court refused to hear the case in 2001 (HCN, 12/3/01: Rocky Mountain Front saved again - but...). "We have a patriotic obligation to provide a legacy for seven generations out," says Flora today, "and to not just drill willy-nilly, like everywhere else in the West." 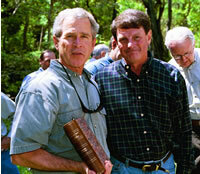 Under George W. Bush, however, the BLM has seen increasing pressure to develop energy resources along the Front. But in early October, Rebecca Watson, a high-ranking Interior Department official, came to Billings, Mont., and announced the agency was halting a study that could have allowed a Canadian company to drill three natural gas wells in the Blackleaf area on the northern end of the Front. "President Bush has met with hunters and anglers and told them there are some places that should not be developed in order to protect wildlife," said Watson, Interior’s secretary for land and minerals management. BLM spokesman Don Smurthwaite says the agency would have spent $1.5 million on studies for the project, and points out that if the project had been approved, environmentalists probably would have sued to stop it. "We had to ask ourselves, ‘Is this worth it?’ " he says. "This was obviously a huge issue to Montanans and people elsewhere. We listened." Indeed, the BLM received more than 49,000 public comments on its draft environmental impact statement. More than 99 percent of them wanted the Front protected from drilling. Comments came from environmentalists, lawmakers and the Blackfeet Tribe. But some of the most vocal advocates of protection have been hunters and fishermen — a contingent whose support is crucial to Bush in the upcoming election (HCN, 9/27/04: Racetrack). "Development needs to occur in a fashion that’s compatible with hunting and fishing uses," says James Range, chairman of the Theodore Roosevelt Conservation Partnership, a coalition of hunting and fishing groups that has met with President Bush twice in the last two years to discuss energy development on public lands. And, he says, "There are some places that ought not be developed at all." But Claire Moseley, executive director of Public Lands Advocacy, a Denver-based nonprofit that promotes energy development, says the BLM acted unfairly when it stopped work on the environmental impact statement. "The company went through the (National Environmental Policy Act) process and they had the rug pulled out from under them," she says. "I think (the government) did it just to placate the environmentalists; you could say this is election politics." The Rocky Mountain Front is one of several recent environmental decisions that have folks grumbling about election-time politics. In September, Interior Secretary Gale Norton visited Moab, Utah, to withdraw 192 miles along the Colorado, Dolores and Green rivers from hardrock mining claims. "The Department of the Interior had wanted the secretary to sign the withdrawal … for about a year," says Maggie Wyatt, BLM field manager in Moab. "But it’s difficult to get on her schedule." The withdrawal does not apply to oil and gas leasing. On Aug. 13, the Forest Service extended the comment period from Sept. 14 to Nov. 15, for a controversial plan to allow coalbed methane development in roadless areas in Colorado’s HD Mountains. On Sept. 8, the Forest Service extended the public comment period for the Roadless Area Conservation Rule from Sept. 14 to Nov. 15 (HCN, 8/16/04: Feds pass roadless headache to states). On Oct. 8, the Bureau of Land Management extended the public comment period for its resource management plan for the energy-rich area around Price, Utah, from Oct. 15 to Nov. 29. Decisions on whether to drill for oil and gas on Colorado’s Roan Plateau have also been delayed, though a spokesman says it’s just because they’re behind schedule. Back on the Rocky Mountain Front, conservationists are celebrating, even though most recognize that the decision to terminate one lease for three wells is largely a symbolic move. "For Bush, this was a low-risk capitulation," says Gloria Flora. "There was the pressure of election and the fear of losing natural supporters (among sportsmen). And it was a Canadian company — so they’re not contributors to the Bush campaign." The author is HCN assistant editor.